It seems the era of the affordable analog monosynth just gave way to the affordable analog polysynth. 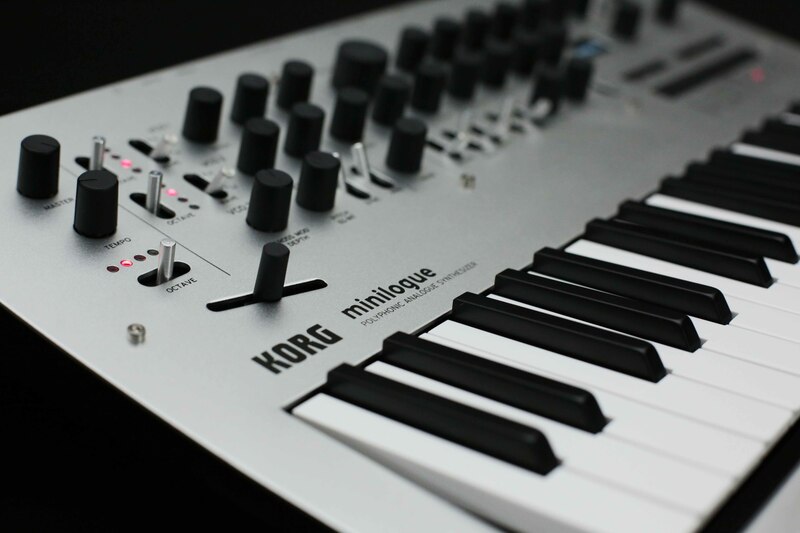 Leaked last week, KORG’s minilogue is a US$499.99 4-voice polysynth. Before you dive into our sprawling review, here’s everything you need to know in a nutshell. Keep in mind – we’ve had this synth since last week, so we’re not just copying specs here. How many voices has it got? Four of them. You can use them in a 4-voice polyphonic mode (that is, playing chords), or a unison mode (with all four detuned around the same pitch), a duophonic mode, or some interesting novelty variations – like a “delay” mode that spreads those voices in time, a dedicated chord mode, and an arpeggiator. And it’s analog? Yes – analog voltage-controlled oscillators. There’s also some analog circuitry around the feedback of the delay (though the delay is digital). Mini keys? Correct, same as the MS-20 mini keybed – nothing spectacular, but playable. Spring paddle what now? Yes, in place of a pitch bend wheel, you get spring-loaded pitch above the keyboard. You’ll either love it or hate it; it makes slow bends tricky, but quick pitch scoops easy. So at this price, it feels cheap, right? Actually, no. There’s a sand-blasted aluminum panel, real wood round the back, and most significantly, chassis-mounted metal potentiometers, so the knobs feel solid and don’t wiggle around. There are also nice big, retro switches. What’s with this preset business? What’s that doing on my analog keyboard? Sellouts. Uh, okay, fine. Well, you can dial up presets onboard or – since you’re obviously an impassioned sound designer – use another 100 user storage slots to save your own. You still get hands-on control of everything. That name is familiar. It’s not an official endorsement from the Swedish electronic duo, though the designers are fans and evidently got approval. What about control voltage? No, not this time. Dedicated MIDI in and out plus MIDI over USB, but you don’t get CV. Did we mention it’s a $500 polysynth? What’s that display for? It’s a small but cute OLED, which displays an oscilloscope (useful with all the wave shaping and cross modulation and ring mod business), plus menus and occasionally signal flow (like reinforcing what the labels on the feedback routing for the delay). 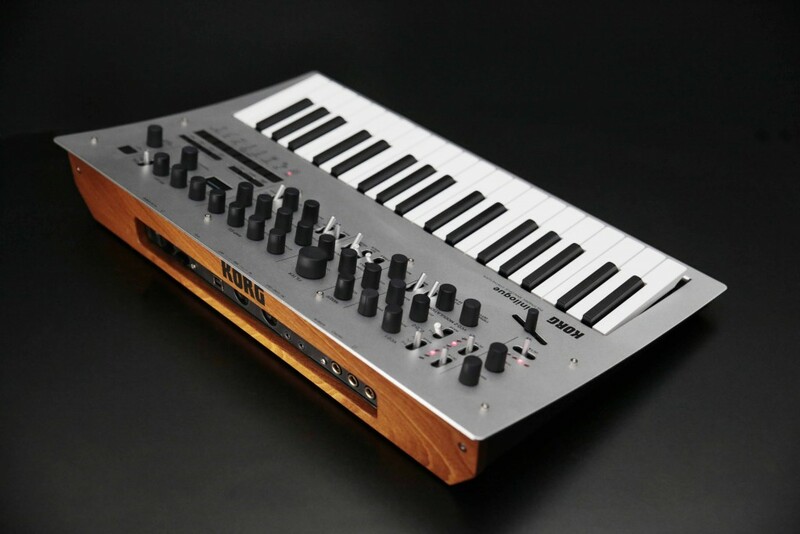 Is there any relation to past KORG gear? Surprisingly, not so much. The delay core isn’t new, but apart from that and the keybed, the oscillator design, delay feedback, overall signal flow, and case design are all new. Why is this man smiling? Why, because Tats has just finished what’s likely to be another big hit for KORG. Who’s behind it? 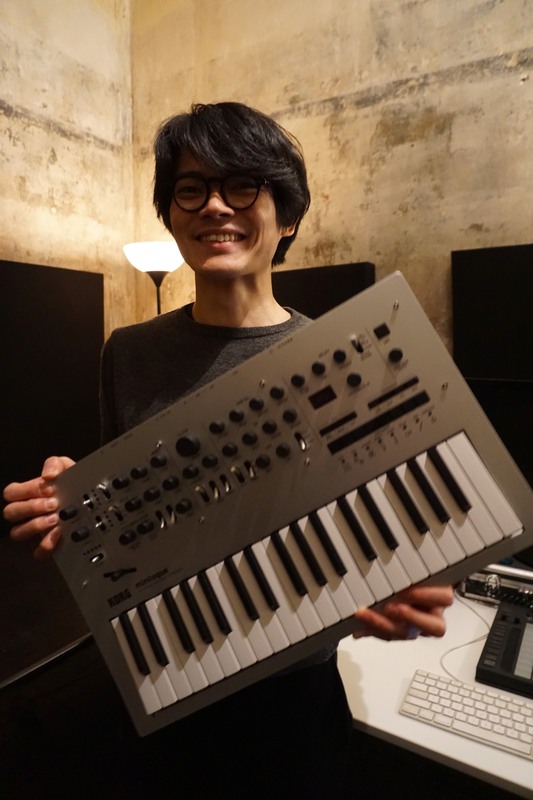 Tatsuya Takahashi from KORG led the design team. “Tats” as he’s affectionately known is the same charismatic designer behind the volca series and monotron, among other recent hits. Thanks for chatting. But I want a big list of specs. It’s, like, this left brain thing. Why, it’d be our pleasure, of course.